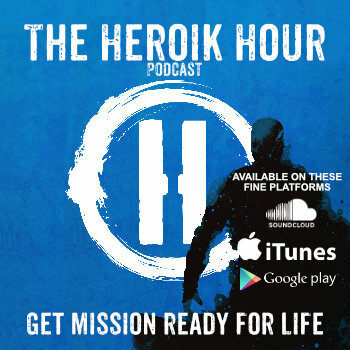 Welcome to the Heroik Hour Podcast the show where we help established owners get mission ready for life – I’m your host, Nicholas McGill and this is episode 206. And we’re going to talk about what to do when you don’t have a map for your business. Imagine you’re loading up with a bunch of friends to go on an epic road trip. Everyone is eager to leave and have a great time, but no one knows where they’re going or how long they’ll be gone. They just know that wherever they end up, they are rich and happy. This is kind of what business owners do from time to time, mostly unconscious level, without an intentional journey. Most jump in with both feet but don’t set clear goals, don’t communicate with the team to get them on the same page. They jump in hoping for the blind success myths they’ve read about on every clickbait website or in all the fluffy, hypey BS business books. They pray they can land success organically, naturally, as if by accident. This motivates, encourages business owners and entrepreneurs to skip over all the boring stuff – the critical, thought work. They skip over the boring stuff these days, all the planning, the gear check, the communications, the meetings, all the prudent steps to success. The formidable work – they skip it. Is it any wonder why 96% of them end up broken down and hitchhiking home a few years down the road? But there are so many owners who start out this way, all ambition, and fire, and they’ve already left home. And if you’re one of them, and you’re smart enough and self-aware enough, it’s dawned on you that you’re underprepared and don’t have a plan. FEW WANT TO ADMIT THIS. I get it – we’re prideful, egotistical alphas hell-bent on success, but we must acknowledge the current position before we can chart a new course. And for many if not most the current position is this: As a business owner, you may not know your current position or the current condition of the business, you might have no map of the model, no plans or documents that you adhere to, and you struggle to admit it. We see this all the time. So this is what we see at Heroik Media, in our consulting practice, we see some really cool ambitious business owners, who set sail without a plan, had some success, weathered some failures, and they want to grow and expand. They want to skip over the problem and go straight to slingshotting past bouncing back and go straight to explosive growth. I get it. Everyone wants that, but it just doesn’t work that way. Today we’re going to talk about some of the most basic elements that owners take for granted, that are fundamental to the groundwork for growing the business. Specifically, we’re going to talk about that map you forgot to pack when you started your journey and the words, numbers, and pictures on it. Now when I say map, I’m referring to the map of the business model, which is an essential ingredient in developing a growth engine. We need to start with a clear, fixed position, an understanding of the business model as it exists today, working or not, we need a snapshot, for many reasons. Having the snapshot isn’t enough. It isn’t enough that we understand your business model in our own language, it’s essential that you and your team understand and acknowledge where you’re at, what’s working, what’s not before we can start recommending possible improvements. Further, the map is useless if you don’t follow it and refer to it. If you deviate from the charted course and don’t track your business, you’ll be lost in no time. But long before that happens there are some other things you need to get in order. A map is many things, but essentially it’s a combination of words, numbers, and pictures. But if we or you and your team aren’t speaking the same language, are looking at different numbers and pictures, it becomes really difficult to plot a course and succeed. So we’re going to talk about this fundamental stage of growth gained from simply getting clear on the words, numbers, and pictures that make up the map and plans of your business. This is a big topic, that I’ll probably circle back to a few times because there is so much to cover, but you’re listening to this because you want to grow your business, and I’m assuming if you already had a map, you wouldn’t be tuning in. But maybe you do, maybe you have your model clearly mapped, or a business plan drafted, but you haven’t used it since you put it together. This is another fundamental problem – some owners take the time to put a plan together, create a map for the growth of their business, but use it to secure alone, and then throw it away, or bury it in a pile of papers filed away collecting dust. And so now, a little further down the road, everything looks different. And even if you could find the old map you had, it doesn’t show your position or condition anywhere on it. So it’s time to draft a new one. But why do you need a map in the first place? Well, long before you can add process, systems, data, metrics, dashboards and leverage them to grow the business, you need shared language, metrics, and maps. It comes down to getting real about the simple Words, Numbers, and Pictures – And the question is, are you avoiding them or embracing them? Of course, you need a map and a plan – you need to put together the pictures and words that tell you where your goal or end result is and how to get there. But we take this concept for granted. Because we assume the pictures and words we’re using are the same that everyone else is using. This is what all these plans, these maps give us. They give us clarity and ensure that we’re using the same words to talk about the same concepts, that we’re looking at the same pictures, and in agreement about the numbers and which ones matter. These are far more important than most people realize until they hit that ceiling of growth in their business. Then there’s a lot of work that has to be done before we even get to sprinkle the Heroik dust into the mix. But the problem also has with it a possibility – if you don’t have a map now, this is an opportunity to leverage it to grow. Because simply by increasing the strategic awareness as an owner, or with your team, you can improve the results of your business or department. The process of crafting, executing, discussing and refining plans improve your results if you’re truly committed to your goals at least. Most owners don’t have any kind of map or plan. There is no document. The plan “lives” in their head, which is just another form of denial, to avoid admitting that they don’t have a plan. At the beginning of every project with every single client, we ask for existing plans and documents, and few owners of established businesses have anything, and if they do, it’s a business plan that was designed to fool the bank into giving them a loan, not a strategic document to guide the company to growth and success. So guess what our first mission becomes? Creating a plan and a map. People lie about this all the time out of shame. Show me the paper. And then they draft something on the spot. Because most owners are just winging it and they know that’s a bad strategy that’s why they hide in denial. If you don’t have a plan, you also don’t have a map, you don’t have a language, or a means of orienting yourself in your business, or orienting others to help you reach your goal. That’s why many seek outside guidance from us in the first place. Without a true map and plan, you will hit a ceiling in your business. And with a map, with some strategic processes, you can sharpen your efforts and grow as a business. This is the first stage of building a growth engine within your business. We can help you do this or you can start an initiative on your own using any number of methods out there. But if you’re not in the habit of doing this, you might want to get some outside help. Getting from A to B, reaching your goal is a hell of a lot harder when you’re flying blind. And it takes much longer if you ever make it at all. Not having a map isn’t the only real problem either. It is also a good indicator that you don’t have a common strategic language or metrics in the company either, at least not that are consistently used. There is likely a lot of confusion, multiple languages and many words and different pictures used to describe the same thing. And I understand all the reasons and I’ve heard many stories why owners don’t have a plan, map or any strategic documents for the business. There are many excuses. 99% of them are basically boiled down to a human preference to avoid the work that doesn’t deliver chemical, instant gratification. That’s what makes the work formidable. The other 1% of excuses is the phobia that a little planning is a gateway drug to no action. It’s true that a business that is all planning, all strategy, gets nothing done. This is true. But if you spending 0% on strategy and planning, all that gets done gets you nowhere. If the business is all tactical all the time – there’s a flurry of activity, but there’s no real sustainable business, no infrastructure, and all fire fighting, putting out the day’s fires, making no net headway. It’s like having a goal of wanting to fly across the country – you can flap your arms and sweat the entire time, or you can take a moment to think about where you want to go, figure out the best way to get there, the best place to score tickets, the right airline, book the flight, pack your bags and go. Obviously, when we’re talking about flying – you can do most of these steps in seconds these days, but the steps are still there. Flapping your arms may make you feel busy. You might go home and sleep well because you are exhausted but did you get anywhere? No. This is what’s happening to most business owners – they’re lying to themselves about their progress – and lost in addictive coping mechanisms and false vanity metrics like sweat, anxiety, worry, and counting problems. Many have deluded themselves into thinking that suffering in all this depression, anxiety and overwhelm is better than living in the truth and getting real with the pictures, numbers, and words of their business. This is the ego criticizing and sabotaging the business. you can’t be off track if you’ve never laid a track in the first place. You can’t be off track if you never set goals in the first place. The problem with putting all of this off is – You also can’t achieve meaningful goals. If this is you, you need to check your ego and ask yourself is living in this lie that just eats at you, that you can’t escape – is this better than just looking at the truth and getting real about the pictures numbers and words in your business – and ACTUALLY HANDLING things? For the few who set goals – most quickly bury their heads in the sand. Of the owners who set goals and make plans an overwhelming majority of them do everything in their power to avoid looking at the scoreboard, the pictures, words, and numbers letting them know how they’re doing. This is like avoiding the mirror, the scale, and the conversation with your trainer when you’re on a diet. This is the same as setting new year’s resolutions for January 1st and then you burn rubber with that date in your rearview mirror and never look back. Pictures, Numbers, and Words. – Are you avoiding them or embracing them? Here’s the other side of this – Along with the avoidance, the next step is to try to outsource any and all critical and strategic thinking. You think some product out there, some service, some app, some system is going to save you? Hell no! The people who build them know exactly how desperate you are, they just want your money and they know you care more about feeling busy than making real progress. So guess what they sell you? MORE FAKE PROGRESS. I’ll give you participation trophies all day if you subscribe to this system. Adopting vendor language is rarely a good idea. You can’t just borrow the language from the vendors. Language and content are tools of the trade, and just by getting you to use their language, they get you to adopt their frame of mind and belief system. And time and time again that belief system is some version of every problem is a nail, and their tool or system is the right and only hammer to use for the job. Using the framing language of vendors warps the strategic business perspective. When you think of the apps and systems you use, guys like me do this by design, adding in programmatic biases at every level imaginable to maximize user retention and revenues. UI/UX – Pictures and words. I’ve helped develop many pictures and words over the years to serve clients, and I can tell you, accepting someone else’s frame of mind for your business, is almost always a trap designed to get you to spend more money. Unless that frame encourages scrutiny, debate, discussion and elaboration, it’s a trap. Vendors and the tactical layer of activity changes often. If you use their language, this means learning a new language every time you switch systems or learn something new. This is expensive, it slows things down, training others, let alone yourself becomes even more bothersome. And if the bulk of your effort and energy is on this layer, you will never have the time, energy or attention to think and move strategically to grow your business. So you need a strategic level to your business where you can create, look at and talk about the pictures, words, and numbers inside your business in a truthful way to keep you on track for your goals. Basically, are you speaking the same language as your partners and team, and those that can help you? Do the numbers add up and if so what are they saying? And are we all looking at the same picture? If the words, numbers, and pictures aren’t the same, it is almost impossible to communicate let alone reach your goal. This is one of those hidden underlying root problems that strategic planning solves, that owners take for granted. –There are many ways to disguise, obfuscate, and bury the truth in bad data. A majority of marketers and business owners do it every day. You better commit to living in the truth at least internally when it comes to your own business. When it comes to pictures, there are many ways to visualize and map out a business model. Every one of them comes with its own philosophies, biases, and methods. If you’re trying to achieve anything with a team, you need to be looking at the same picture. All of this also requires a long term view. If it was short term, it would be more tactical. You need to hold on to your particular strategic picture, for at least a year or more. People struggle with these kinds of commitments, but would you rather suffer day to day or grow year over year? It’s up to you. Get Real About The Words, Numbers, and Pictures – Get it on Paper. When You Start Getting REAL With Words, Numbers and Pictures- some awesome things start to happen. You know your position and momentum relative to your goals. You are in the game. Even if you’re losing the game – at least you’re finally in it. I’d rather be in the game than on the sidelines. I hate being on the sidelines. Some people like it – I get bored. I am like a dog at a soccer field – I want to be in the game. I want to drive my destiny. How about you? You can look at the same scoreboard. You might even know the score. You can finally tell if you’re winning or losing and if you’re in the right game. This means you cut out 90% of the excuses and can focus on addressing the gap between you and your goals. The challenges you are left with are smaller than you think because you can measure them. The unknown dragons we battle in our heads are often bigger and scarier than the ones we face in real life. You can create a plan to reach your goal and get out of the larger problems you’ve endured for years. I’m not telling you which method is better or what plan type to use – just about anything is better than the placeholder of nothing, and start getting honest about the words, numbers, and pictures in your business. The words, numbers, and pictures make up the language, metrics and maps for your business and your life. Stop hiding from them. Make sure you’re speaking the same language. And learn the language if you need to – don’t hide from your own ignorance. Get educated. We use a combination of approaches to help clients map their business models including canvases, maps, and various assessments, and if you’d like some outside help and guidance on this foundational work, check out our website at www.getheroik.com under the get started tab there is an application for a rapid-fire assessment, you just give us a little bit of info about you and your business, and we look at that and decide if we’re a good fit for each other, or if there is the best next resource to point you to. The topics I’ll cover on this podcast will often be way more complicated, because I don’t like covering the basic fluff, there are plenty of high carb podcasts that have that covered, and building and growing a business is really an intellectual sport, you need energy and endurance too, but it’s essential to things through to ensure your efforts are aligned with your goals. Be sure to check out our website at www.getheroik.com – Until next time I’m Nicholas McGill and you’ve just heard another awesome episode of The Heroik Hour.